What happened to Russia's political protests? Participants of the Nemtsov March, in memory of the former Russian Vice Prime Minister who was killed two years ago. 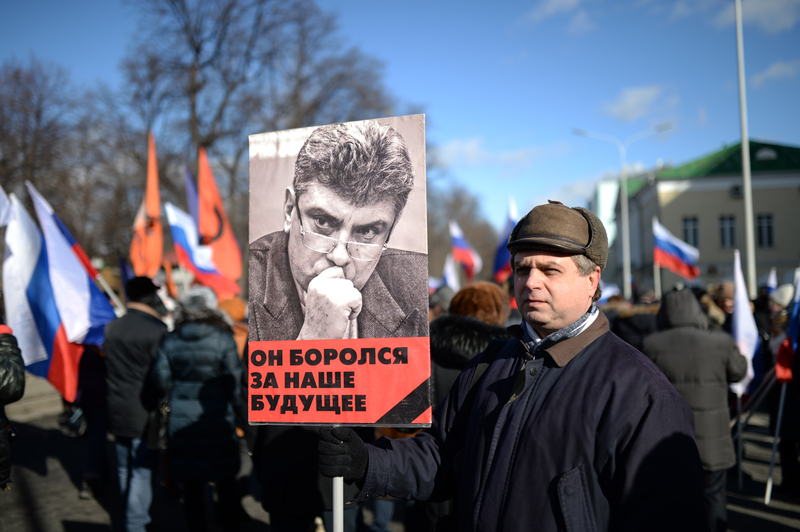 The largest opposition protest of the past 12 months, the Nemtsov March, took place in Moscow on Feb. 26. However, independent experts and even the demonstrators themselves say Russia’s protest potential is on the wane. The Nemtsov demonstration remains perhaps the only regular opposition protest, and in general the last two years since Nemtsov's murder have seen few large-scale protests. Moreover, no one expects political activity in the near future to be as intense as it was just five years ago. The angry citizens, who in 2011 and 2012 filled Bolotnaya Square and Sakharov Prospect demanding change, have left the streets, and do not plan to return in the near future. The Nemtsov memorial march is perhaps the only exception. "[In 2011-2012] people were indignant because their political rights had been taken away, but these people were not poor people; they had enough food, but they felt it was important to be able to choose their government," said Dmitri Stepanov. Dmitri is 37 years old and works as a specialist in IT equipment sales. He was one of those who took to the streets after the 2011 State Duma elections, demanding that they be recognized as unfair and that citizens regain the right to vote. He remembers how drastically, almost mystically, a certain tectonic shift occurred in the minds of many people: from the notion of "democratic rights are gradually being eroded but still exist," to "there are no political rights whatsoever." At that time, people started protesting, but those who led them did not have a clear strategy. "We lost that battle, and now only about 300 people regularly protest on Moscow’s streets," said Stepanov, who is one of those 300. "In all of Russia there are only about 1,500-2,000 demonstrators. The other tens and hundreds of thousands are waiting for things to develop because they still do not see the point of going out and protesting. What will it lead to?" Stepanov’s sentiments echo what opposition leaders are also saying. Today, disillusionment is the principal emotion, said State Duma deputy and opposition member, Dmitri Gudkov, and all feelings of dissent are now vented in the kitchen. "The problem is in the format of the protest; the 2011 protest was emotional, which is always vivid, but now protest has become routine," said Gudkov. "People are not willing to use political slogans, and not only because they no longer believe in change," said Ilya Yashin. "Many are afraid. There was a trial in the Bolotnaya case, and criminal cases were opened against social media networks. This creates an atmosphere of fear. The normal person will think a hundred times before going out to demonstrate and subjecting himself to risk." The government's position on this matter is quite clear: the law is the law for everyone, and no one can organize riots and use violence against policemen. "The government must not be harsh, but it must make sure that everyone follows certain rules. Otherwise… we may encounter the problems that occurred in 1917," said Russian President Vladimir Putin, referring to the Russian Revolution in 1917. "The future of political protest is the social-economic base," said Pavel Salin, director of the Center of Political Studies at the Russian Government Financial University, adding that today no one knows how to translate social-economic dissatisfaction into political slogans. "The greatest protest potential lies in the social sphere, which is linked to the decline in living standards," said Sergei Markov, director of the Institute of Political Studies. "This has mostly affected poor people, and it can be seen, for example, in car sales statistics: sales of low-price cars have declined, but they have not in the luxury class." A year on, what do we know about Boris Nemtsov's murder? Also, on top of unresolved problems new ones are appearing, such as paid parking which in Moscow is the equivalent of $3.20 an hour, a hefty sum for the average Russian, added Markov. Nevertheless, today the country’s protest potential is weak. With the crisis in relations between Russia and the West, most citizens see protests against their government as unpatriotic. The second reason is that the opposition has discredited itself with its attitude towards the Ukrainian crisis. "You can have your own opinion about Crimea, but support for a Russophobic regime [in Kiev] damages the opposition's reputation in a major way," said Markov. Opposition leaders often speak about unequal conditions in the political realm. They are much weaker when it comes to media resources, and practically do not have any administrative resources. "Imagine we have a race, and I run all 400 meters but the government candidate runs only the last 100 meters; in addition, I also face a whole bunch of obstacles," said Gudkov. Those who continue attending protests believe that the root of the problem lies in something else. "I don't know who had these expectations, that Nemtsov's death would unite us, but the opposition cannot unite because it lacks a common goal," said Stepanov. "They are more worried about not disappearing from the political landscape, and try to find a reason to justify their own existence." The data for 2016, 2017 was presented by the Bely Schetchik movement; for 2015, by protest organizers.